Chris Kunitz #14 of the Chicago Blackhawks looks to pass against the Arizona Coyotes at the United Center on October18, 2018 in Chicago, Illinois. The Coyotes defeated the Blackhawks 4-1. 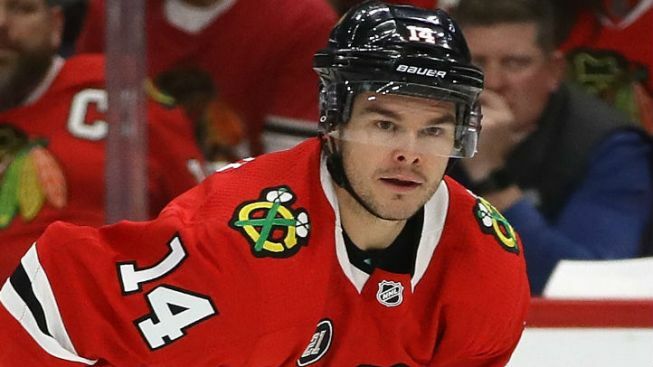 Chicago Blackhawks forward Chris Kunitz was ejected from Sunday's game against the Calgary Flames after a high hit on Travis Hamonic. Kunitz was along the boards in the second period when he lifted his elbow and hit Hamonic hard, sending him sprawling to the ice. Chris Kunitz ejected from the game after this hit on Travis Hamonic. The #Blackhawks have given up 2 goals, halfway through the 5 minute major. Officials didn't appear they were initially going to call a penalty, but after conferring they decided to give Kunitz a five-minute major for elbowing and a 10-minute game misconduct penalty. The Flames ended up scoring on a pair of goals on the ensuing power play, as Derek Ryan and Elias Lindholm each notched tallies.